Composed by Jacquelyn G. Kleine. 21st Century, Contemporary Classical, Impressionistic, Native American, New Age. Individual Part. 1 pages. Published by Jacquelyn Kleine (S0.13567). 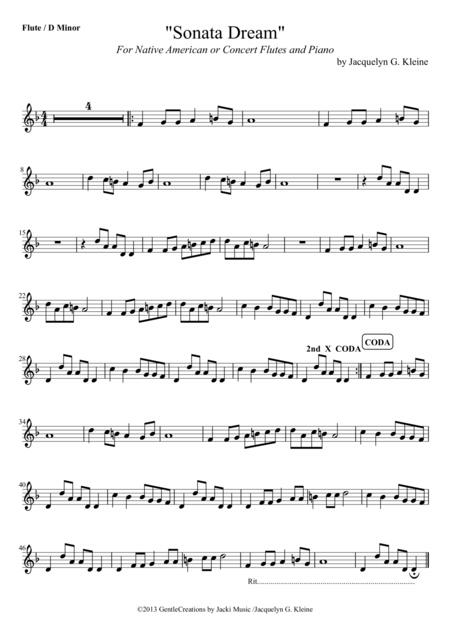 "Sonata Dream" Flute part D Minor. "Sonata Dream" for Native American Flute or Concert Flute with Piano accompaniment is a soothing, meditative, contemporary instrumental piece. Separate Piano Accompaniment (or other Flute) parts are available in E Minor, D Minor and G Minor. "Sonata Dream" is also available for Native American Flute in Nakai TABlature and your choice of Piano Accompaniment in E Minor, D Minor or G Minor. NA Flute TAB can be used for any key Native American Flute, and the Nakai TABlature system can be easily found online.